� Cook has been eliminated from six AVP qualifiers in her career, and five of those losses were three-set matches. 2018: Cook continued her partnership with Spieler, starting off the AVP season with a third place finish. The duo played seven tournaments together, finishing below seventh just once. Cook ranked seventh on the Tour in aces (.88 per set). 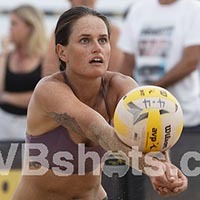 Cook played in two FIVB tournaments, finishing 25th with Lauren Fendrick and 33rd with Spieler. 2017: Cook played one AVP event with Lara Dykstra, finishing 13th, and six times with Katie Spieler with a best of ninth three times. Cook tied for 10th in aces (.74 per set) and was ninth in kills (6.71 per set). 2016: Cook played five AVP tournaments with five different partners, playing in the qualifier each time. She played with Carly Wopat, Brittany Tiegs, Sara Johnson, Amber Walker, then finished in seventh place with Katie Spieler. 2015: Cook made her AVP debut in Manhattan Beach with Michelle Iafigliola. The duo advanced from the qualifier to place 25th. College: Cook played four years as a setter at Stanford, helping the team to the NCAA Regional finals twice. An engineering major, she left the school ranked seventh all-time in assists. She then transferred to Hawai'i where she played beach volleyball and received a Master's degree in Civil and Environmental Engineering. Competing with Brittany Tiegs she was the AVCA Pairs National Championship runner-up, and was an AVCA All-American. She ended the year with a 42-7 match record. Personal: Born in Salt Lake City, Cook went to high school in Santa Cruz, Calif. She was a member of Volleyball Magazine's Fab 50 and competed with the USA Junior National Team in the 2009 World Championships in Mexico. Her father, David, played basketball at the University of San Diego as well as professionally in Australia while her mother, Suzy, played volleyball at United States International University. One of four kids, her younger brother Brian played volleyball at Stanford. In 2015 she was named as assistant coach for Stanford beach volleyball team.